In 2004, Chacabuco Valley, in the transition between southern beech forest and Patagonian steppe, was at the centre of one of the greatest land buys in history when Doug Tompkins, the US co-founder of The North Face outdoor wear (and much else), fell for the cadmium mists and purple grassland. The Belgian owners of Chacabuco sheep ranch were not turning a profit, so Tompkins bought their land. It was overgrazed and in bad shape—the consequences for the soil are still evident. Tompkins’s love affair with the region had begun decades earlier. He had first visited in the 1960s to do some ski-race training in the off-season. Seven years later he drove from San Francisco to climb Mount Fitz Roy, and that, according to his wife Kris, sealed “his love of that part of the Southern Cone”. The Tompkins founded Conservación Patagónica, an NGO that develops projects to create parklands, restore biodiversity and promote ecological agriculture. At Chacabuco, for example, they proceeded to implement an ambitious rewilding programme. The strategy was to buy land and turn it over, protected, to the nation. They set about piecing together plots that would eventually become Parque Patagonia and Parque Pumalín. I don’t think the two Americans ever thought of themselves as owners. They were stewards. I travelled on the fabled Carretera Austral, or Southern Highway, which is the only road there is. It unravels 1,240 kilometres from Puerto Montt to Villa O’Higgins. (It changes its name at the northern terminus, but basically you could keep rolling till you reached Vancouver.) Around Mallin Colorado the carretera turns into a dirt track, and between Coyhaique and Puyuhuapi into the brutally snowy one-lane Paso Queulat. I was frightened there, and lonely, with no phone signal and no hope of a friendly rescuer if I slid into a drift. Around Chaitén, the Pacific appeared—one had almost forgotten it was there. At the snow-filigreed pass south of Balmaceda I saw shaggy huemuls, the endangered South Andean deer. The natural beauty was a redemption of sorts from the solitude of the open road, and from everything. After leaving Saucedo, I climbed high and east in the crepuscular light, the road a slender silver precipice above luminous lakes. The shadow of a flock of black-necked swans flickered on a mountainside. I Skyped with Kris. I don’t know where she was, but she was sitting on a chintz sofa and wearing a mustard sweater. A youthful 68-year-old with long, honey-coloured hair, her commitment to the rewilding projects zinged out of the pixelated screen. “We have donated all our land now,” she said. “Last year we offered the state our final million acres if they matched it with their contiguous 9.3 million acres. They did.” Across the border, the foundation has given 800,000 acres to the Argentinian government. The Tompkins leverage conservation value by getting governments to donate land in tandem with their own. Both former Chilean president Michelle Bachelet and her Argentinian counterpart Mauricio Macri met Kris when the land deals for the parks were signed. Heading north from Parque Patagonia, I entered a moister, more temperate zone where ferns dominate the foliage and Chilean dolphins were fluking in the cold waters of the fjords. I saw a lot of salmon farms. The industry, mostly foreign-owned, is a huge employer and huger polluter. The business took off in the mid-1980s, and Chile quickly became the world’s second largest producer of farmed salmon after Norway. I was shocked to witness the rise in production since I first visited 30 years ago. Firms have plans to expand still more in the south of the country. Besides aquaculture, environmental threats include mining and hydroelectric dams (graffiti protesting against those pops up all over the place). Parque Pumalín, pronounced Pumaleen, consists of almost a million acres of temperate evergreen rainforest spiked with mountains and glaciers. I hiked a trail with Erwin González, the park administrator. It was raining. That’s the trouble with rainforest. But it’s not like the Amazon rainforest here. Pumalín is an attenuated landscape with just 20 species of trees and 10 of mammals. Pablo Neruda, one of Chile’s Nobel laureates, wrote of the southern trees, “from their cold green eyes 60 tears splash down on my face … Anyone who hasn’t been in the Chilean forest doesn’t know this planet.” He came from a place just north of Patagonia, and also wrote of “the great southern rain, coming down like a waterfall from the Pole”. González and I were looking at alerce, a rain-absorbing hardwood that is soft, everlasting and resistant to fungi. Its tiles were once widely used for construction. “Alerce used to grow everywhere north of here,” González said. Close to Fandango Bridge (they love their place-names) we saw a 3,500-year-old specimen. It was tall, its shallow roots spreading laterally. Now alerce only grow in southern Argentina and Chile, and the species is protected. Copihue bellflowers dangled like drops of blood. González touched the bark of the big tree. He seemed so much part of the landscape that one had the sense he was the 11th species of mammal. At Caleta Gonzalo, on a wharf overlooking Reñihué fjord, I waited for a ferry to convey me and my car through a labyrinth of channels up to Hornopirén, a four-and-a-half-hour journey. On the grass next to the dock, huet-huet birds whooped among a flock of persimmon-breasted chucao. González, originally from Santiago, has worked for Tompkins Conservation for 10 years. He waited with me at Caleta Gonzalo, and teared up while showing me sketches Doug had drawn when the two of them were planning Pumalín’s information centres. The pencil drawings depicted hexagonal buildings on pages torn out of a notebook. “Doug was my inspiration,” González said. “He was visionary. And he has passed his vision on to us.” We sat in silence and contemplated the man as the ferry approached. 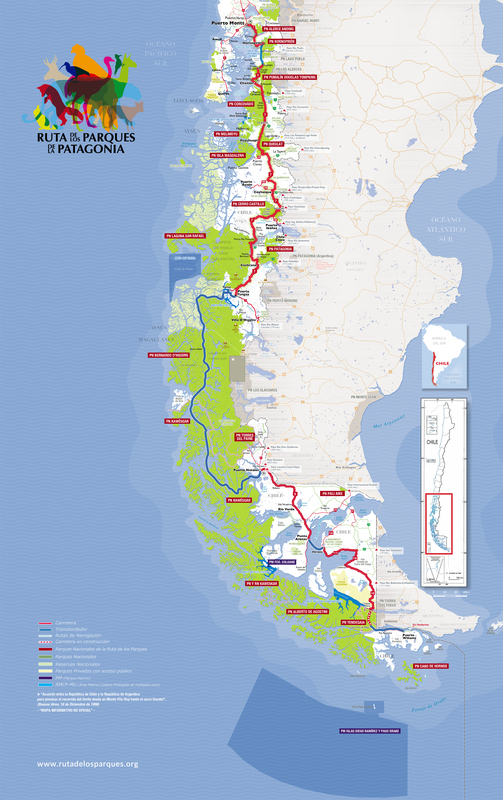 The latest Tompkins project, launched last year, is Ruta de los Parques, a road (not a string of hiking trails, as has been reported) linking 17 national parks from Puerto Montt to Cape Horn. As Kris says, “There is still lots going on. It didn’t end when we donated the land. I am a bit of a Calvinist, and not very celebratory. Our goal as a foundation is to stay small and focused. I believe in hard work. I love projects where you start at zero.” And so the love story goes on. Abercrombie & Kent can create an 11-night trip, such as this one, from £3,740, including flights, accommodation, car hire and guides.